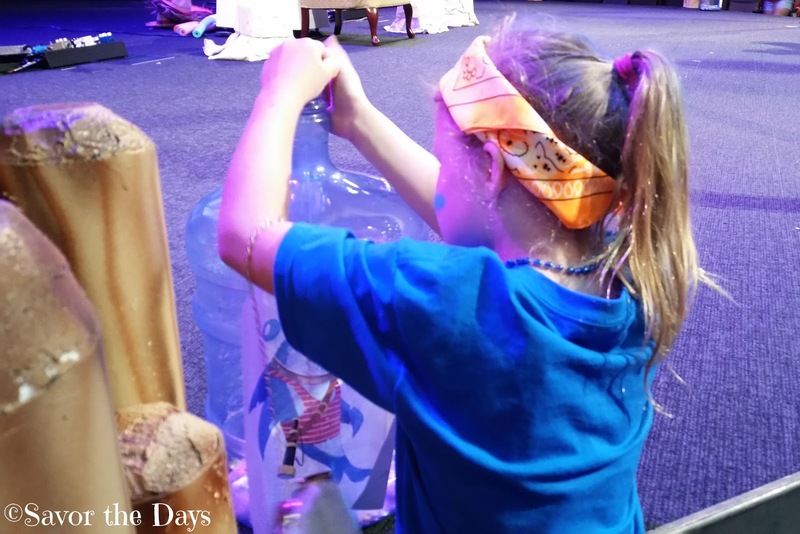 Savor The Days: What an Amazing VBS! My kids always love going to VBS in the summer. 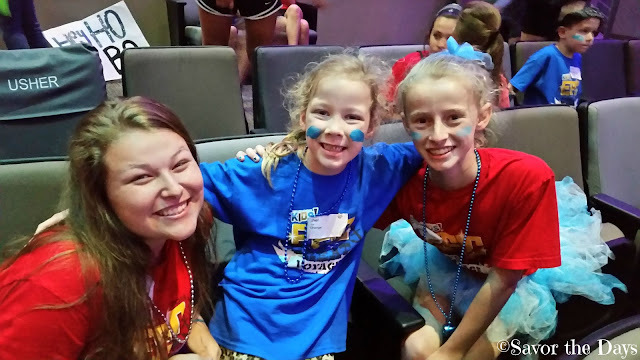 They have fun with friends, play games, have yummy snacks all while learning about and worship our great God. 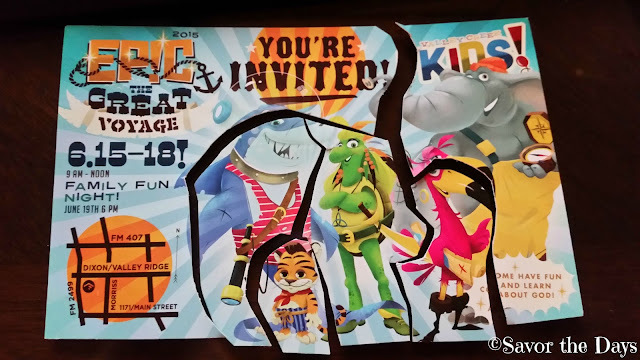 But this year, Nicholas is too old to go to VBS. I was devastated when I went to register him and it said Kindergarten through 5th grade. He is entering 6th grade this year. 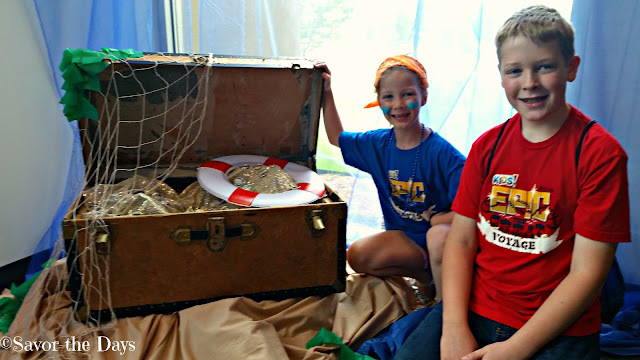 But as I looked around the website a little more I realized that in 6th grade he can volunteer at VBS! Woo hoo! Not only would he still get to be there for all the fun but he would actually be a part of sharing that love with younger kids. Amazing! 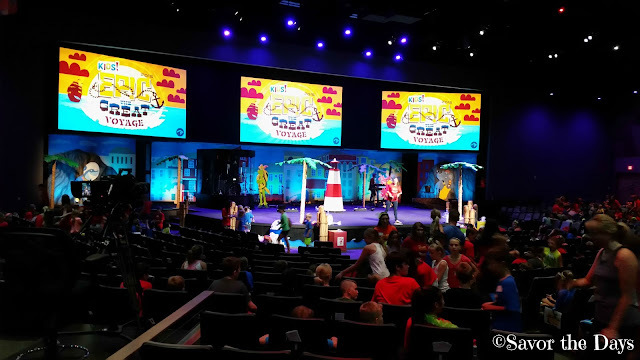 For the week before VBS actually started, Nicholas went to church every day for about 4 hours at a time to help them turn the whole inside of the church into a magical place of wonder for "The Great Voyage" theme this year. He worked on turning a hall into the inside of Jonah's whale. See the back bone and rib cage? 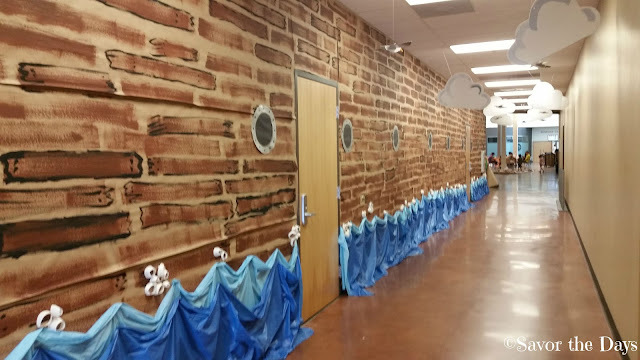 Another hall was a boat on the ocean. I love the waves made of blue vinyl tablecloths and the tops cut off of white plastic drinking cups. So creative! And how can you save money on decorative life saving rings? 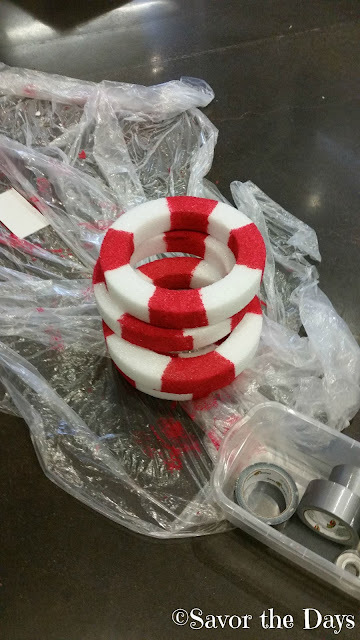 Buy white stryofoam rings and paint red stripes on them! 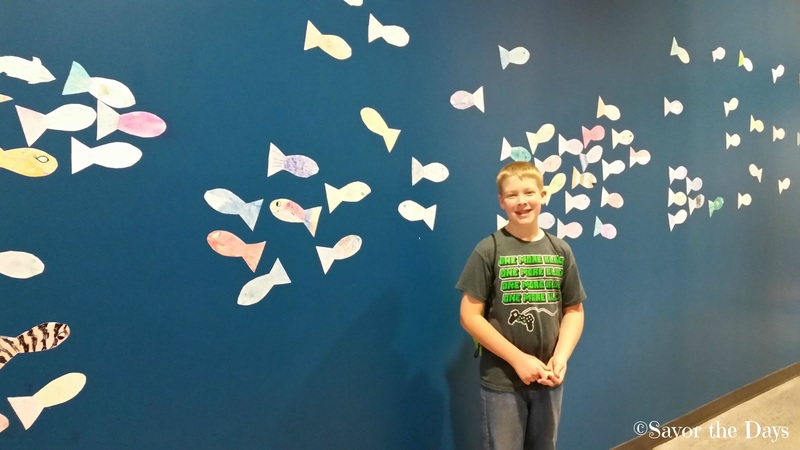 Nicholas also got to make and custom decorate lots of paper fish to swim in the ocean. He had lots of themed ones....a school fish, Iron Man fish, Captain America fish, Hulk fish, Pokemon fish, popcorn fish, smiley face fish, etc. He definitely had fun with this part. The kids are divided up into groups and Nicholas would be one of two leaders for a group of kids. There are several different animal characters in the program so the kids are first assigned an animal then they are subdivided by colors. Nicholas had just said that he hoped that he didn't get put in the Zoe group and just minutes later I got an email from the church saying he was in charge of the Zoe Brown group. I asked him why he didn't want to be in Zoe and he said because Zoe is a girl character and she is a very pink flamingo. 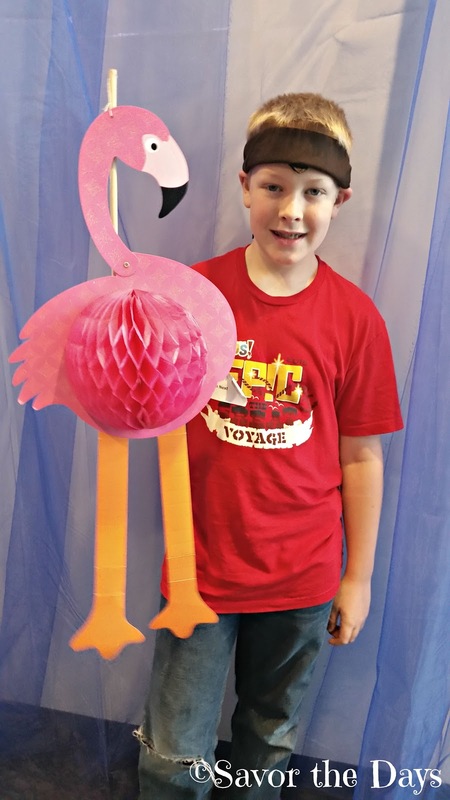 But he handled it well and even came up with some good responses if he had younger boys in his group who complained about being in the pink flamingo group. 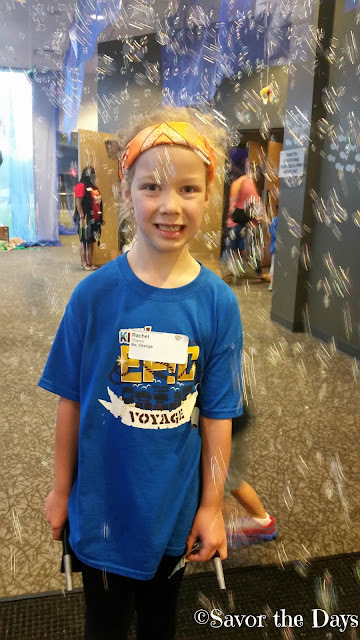 Monday rolled around and he was excited to see how his first day as a VBS volunteer would go. Rachel was attending as a participant and she just loved that the hallway into the main sanctuary was made to feel like you are in the ocean. There was blue fabric and fish hanging from the ceiling, bubbles galore, and fun music playing! Inside the sanctuary, the energy was bubbling over. How exciting for these kids. God will do amazing things here this week! Rachel was in Bo Orange group. 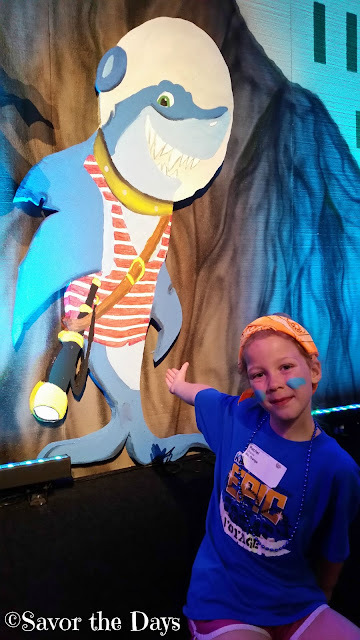 Her leaders gave them orange bandanas to wear and painted blue on their faces to look like Bo the shark. When I picked her up, she asked for some coins to donate to the VBS mission outreach. She was so excited to add her coins to the big jar on stage. Rachel has been carrying around some post card invitations to VBS and she cut one of them up to make it into a puzzle. 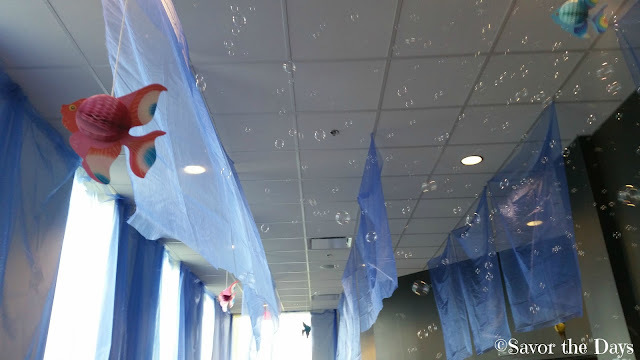 Bubbles, bubbles, everyday! 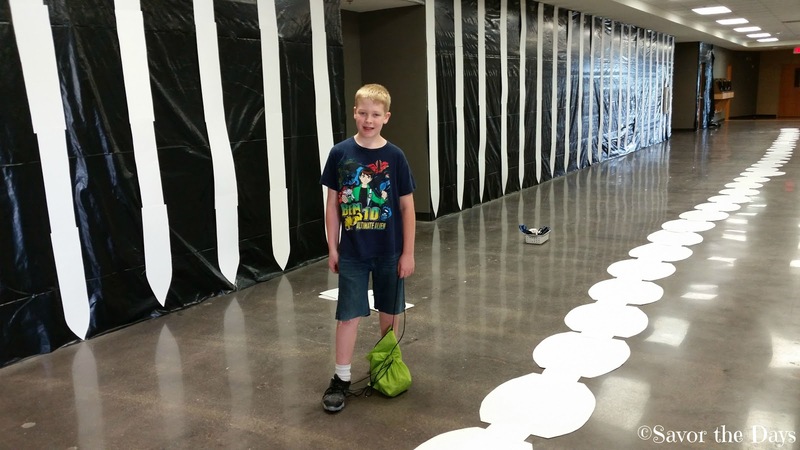 How could you not be excited to walk through this many bubbles each morning! 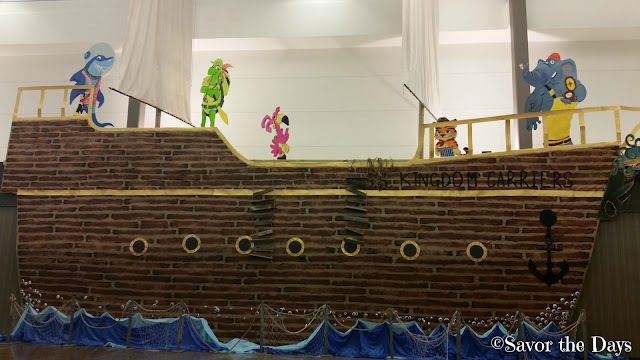 The main lobby held a giant 15-20 foot ark for Noah with each of the animal characters aboard. 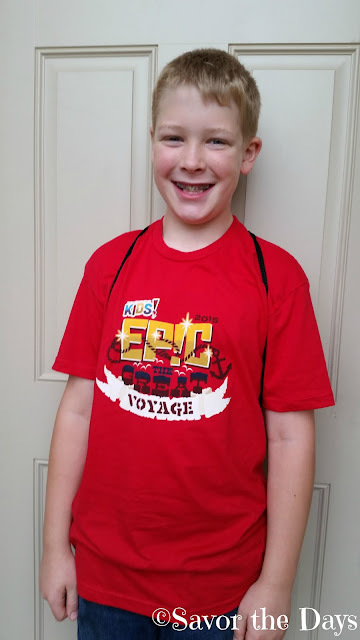 Nicholas asked to go to Party City to get some spirit items for his team. We found this awesome pink flamingo which I thought for sure he would refuse to hold because it is pink. But I was wrong. He wanted to be a good leader and get his team excited and that was more important than his dislike of the color pink so he got it. He also got some brown bandanas for his team, some crosses that we made into necklaces, and some whistles for them. 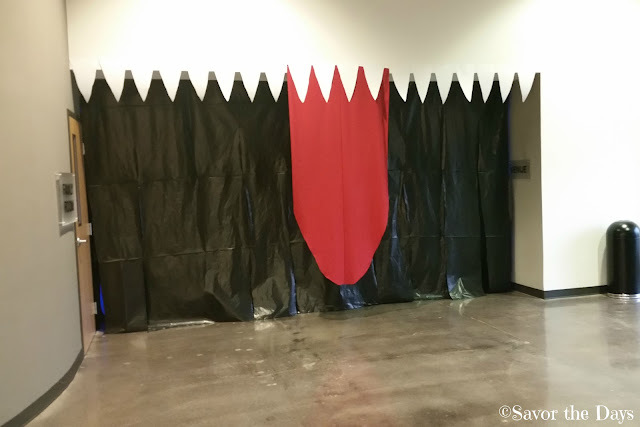 I noticed that they had decorated the outside of the Jonah's whale hallway to show that you are going inside the whale's mouth. So cute! 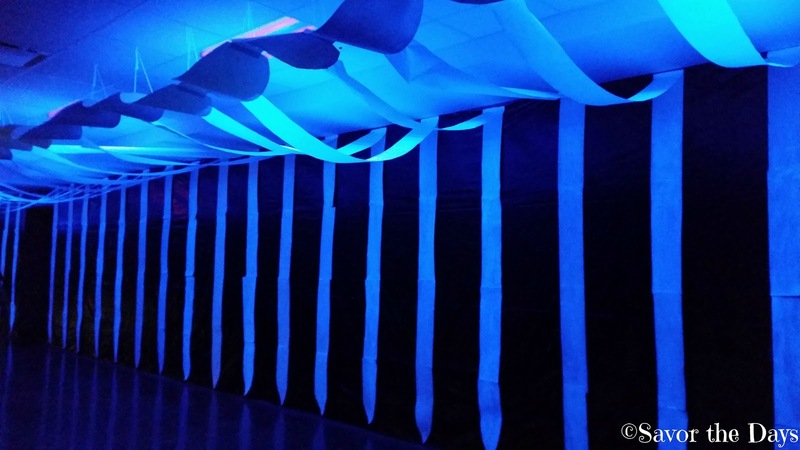 And inside the whale was complete and lit with a black light that gave it an awesome glow. Tomorrow night we all come back together for a big fun family night outside with bounce houses, water slide, a petting zoo, and more! We can't wait!